Our opening hours are 9.30am-5pm on Monday, Tuesday, Wednesday, and Friday and 9.30am-7.30pm on Thursday. We are also open on Saturday from 12pm to 4pm. If you would like to visit the Library outside these hours, please contact us. We have a range of events that happen at the Library outwith these hours and can accept book returns 30 minutes prior to the start of these events. Check our events calendar to see if there is something you would like to come to or something on at a time you can come along to return or borrow books. The Library is wheelchair accessible, with lifts to the first floor and the mezzanine and archive. An induction loop is available for events – please let a member of staff know if you require this. We have disabled toilets on the ground and first floors, and all the Glasgow Women’s Library bathrooms are individual closed stalls and are gender neutral. There is a quite heavy door on the way in to the Library – we are currently looking into power-assisted doors, but in the meantime our front of house team are available to help with accessing the Library. If you need help accessing the library, or would like more information about access, please contact us and we will be very happy to offer you assistance. You can listen to an audio descriptive introduction to GWL, produced by VocalEyes, below. This recorded guide highlights GWL’s achievements, detail how to access our resources, outlines our provision for blind and partially sighted visitors, and includes descriptions of the architecture and layout of our building in Bridgeton. The Library is just around the corner from Bridgeton Cross – you can reach the Library on Landressy Street from London Road, or on foot from James Street. Get directions to Glasgow Women’s Library on Google Maps. 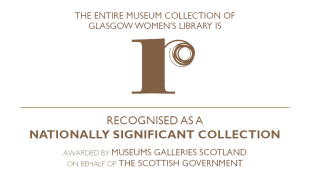 The closest railway station to the Library is Bridgeton station – take the low-level train from Glasgow Central. Please note that Bridgeton Station is not wheelchair-accessible, and the platforms are accessed by a long flight of stairs. The closest wheelchair-accessible station is Dalmarnock Station, which is approximately 3/4 mile (1.2 km) from the Library. Cycling Route 75 follows the Clyde to Glasgow Green which is a 3 minute ride from Landressy Street along cycle paths. We suggest using CycleStreets.net to plan your journey to and from GWL. There are bike racks in the small square on James Street as well as our very own bike shelter which is available for visitors. It is locked but please ask our front of house team if you would like to use it. We always encourage our visitors to use greener methods of transport when visiting GWL but we understand that sometimes using a car is unavoidable. To ensure that our neighbours can park on the street without any problems, we ask visitors to please park in the car park opposite our building. There’s plenty of space and there are no charges for parking your car there. Please contact the Library if you have any questions about access. We run a full programme of events and activities around the year, as well as venue hires, which can mean that the library is quite busy at times. If you are looking for a quieter day, we suggest coming along on Mondays. There may still be some events going ahead but we’ll try our best to find a quieter space for you. You can always give us a call on 0141 550 2267 before making your visit if you’d like to know what’s on.